A fancy and long title hay? 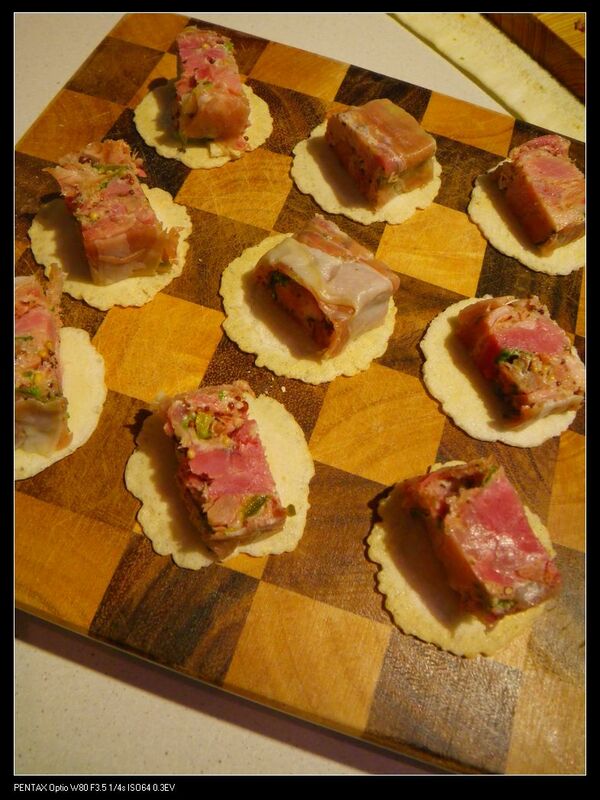 I am sure everyone had terrine before. If not, you must have heard of it. 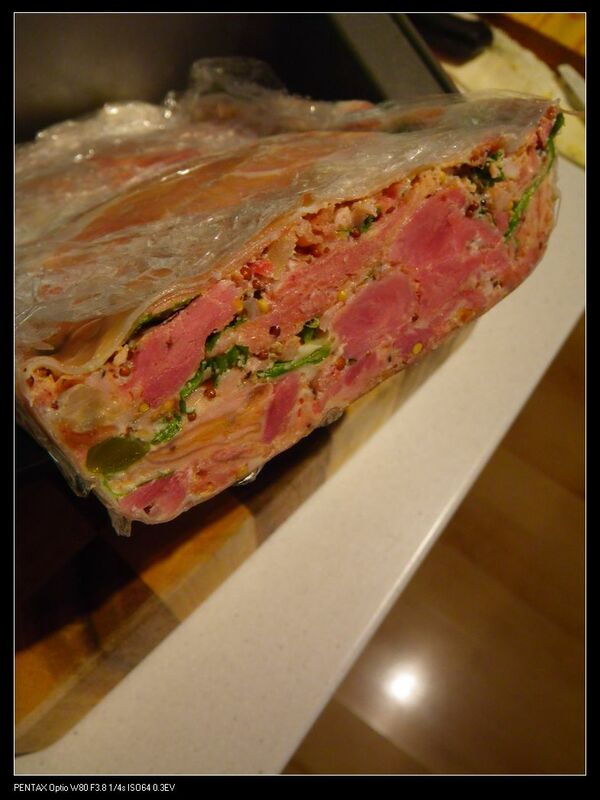 (Just in case if there still are ppl who has’t heard the term before) A terrine is a French forcemeat loaf and is very similar to pate. 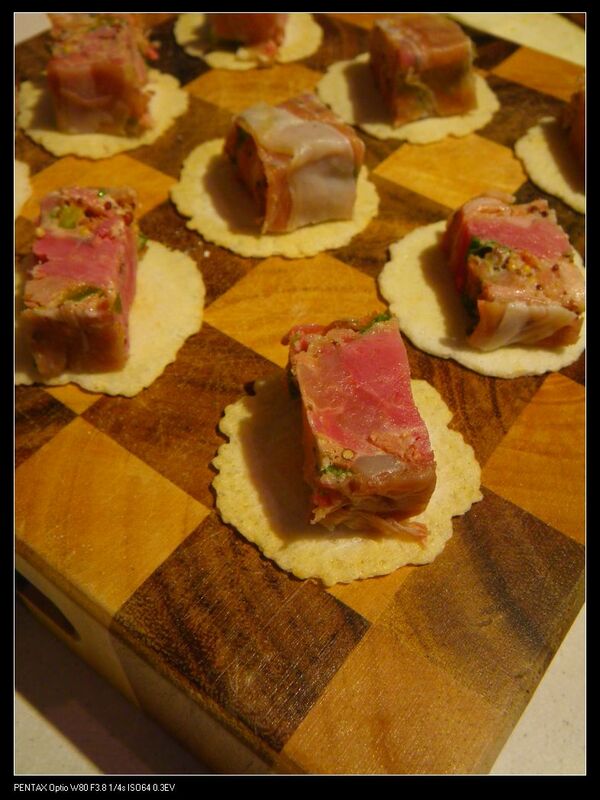 While a pate is made from mainly offal of poultry, a terrine is made from meats of various animals. They are often served cold but in some European cultures, can be served pan fried. Now, there are many ways to make a good terrine. In traditional method, raw meats and other ingredients are placed in the terrine mold, roasted, cooled and tightly packed etc etc. Anyway, in one word, complicated! Today, I am going to tell you a easy terrine recipe which you can just do well at home and amaze some guest for next gathering. Now, what do we do? We are going to make a stock to get the hock and duck meat off the bone. To do this, we need to boil them with some vegetables to add the herb and vege flavour into the meat. You can use normal pot and boil the whole thing up for 2-3 hrs on stoves or in oven. I like to use electric pressure cooker. 40 mins can get the meats well apart. I used the following vegetables but you can change the type and amount according to your liking. 1) 4 potato, 4 carrots – cut into blocks. 2) a bunch of celery – we want to reserve the leaves for future uses, so just the stems – cut into blocks. 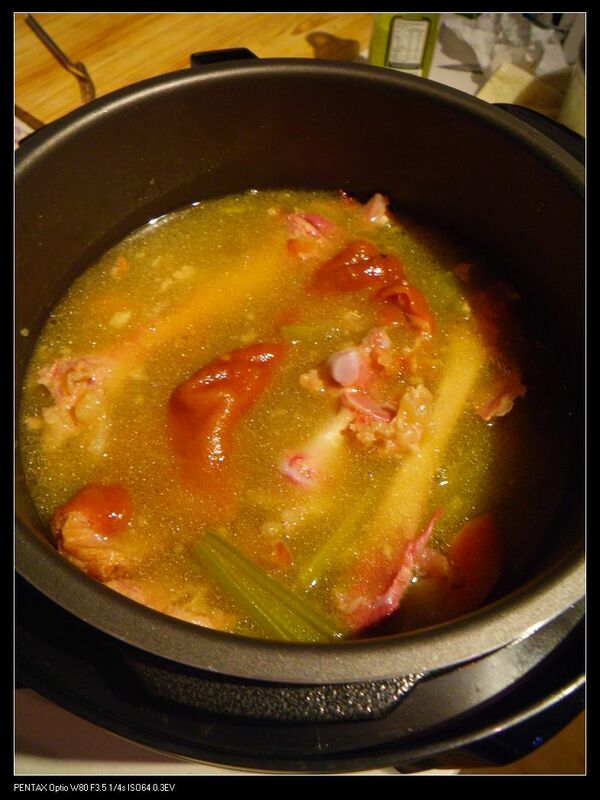 Now place the pork hock and duck bone into the electric pressure cooker. Add the above vegies and cover with 4-5L of water. Put the power on. After 40 mins, here you go. You now have a full pot of liquid gold. Try to pick up every single pieces of meat possible. For the liquid, you can have a taste. They are already salty and full of aroma. You can drain the contents and save the liquid as a stock for other future uses. 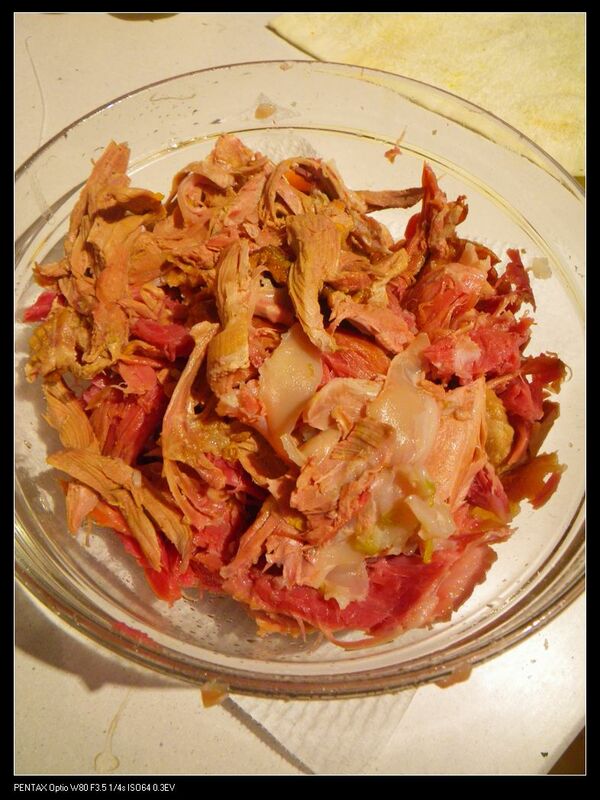 Anyway, back on to the meat, try to pick all the meat and put them in a bowl. We want to pick the meat while it’s hot so that they can be easily reshaped. 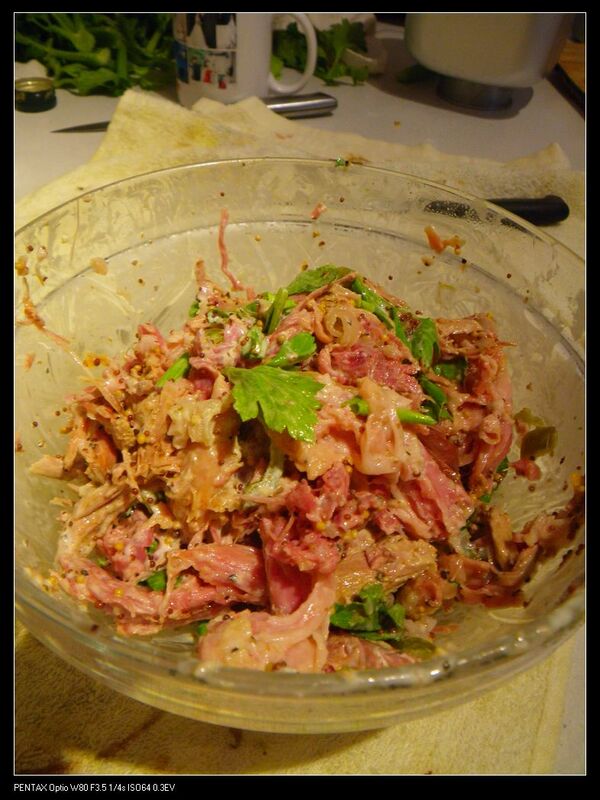 Now, while the meat is still hot, we want to give it some extra flavours by mixing with other ingredients. Some chef said to use mustard butter, it’s absolutely fine but because my wife can’t eat butter :(, I used Japanese mayo instead. 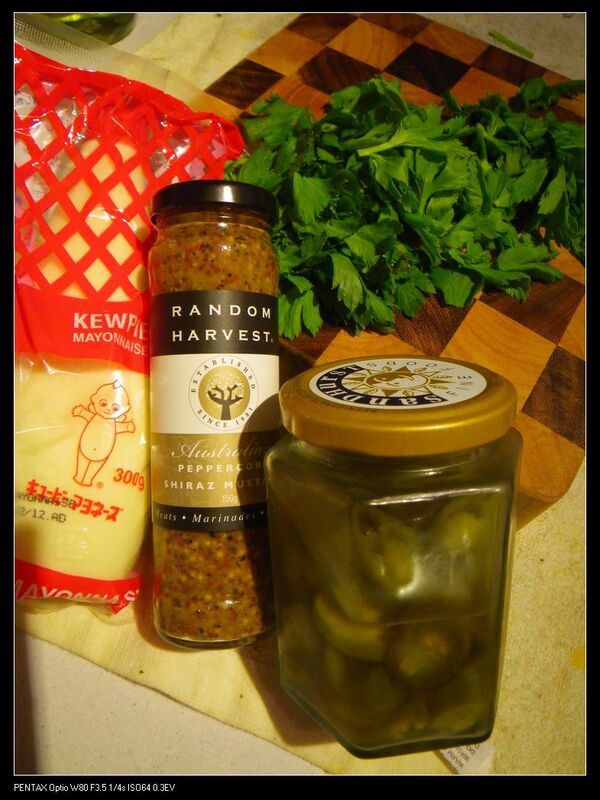 Other ingredients include wholegrain mustard, 4-5 jalapeno pieces and the celery leaves we reserved from above ( can be finely chopped). You can add whatever you want though as many chefs love to add parsley leaves instead of celery leaves. We also want about 2-3 table spoons of mayo (or butter) and 4-5 table spoons of mustard. Again, modify with your likings. Now, let’s get dirty!! Use your hand, of course with gloves :D, to well mix the ingredients including the meat and make sure the meat is separated into smaller pieces. Caution: the meat is hot so be careful! I’ve cut a rectangular shaped foam box to fit into the mold but you can use whatever. 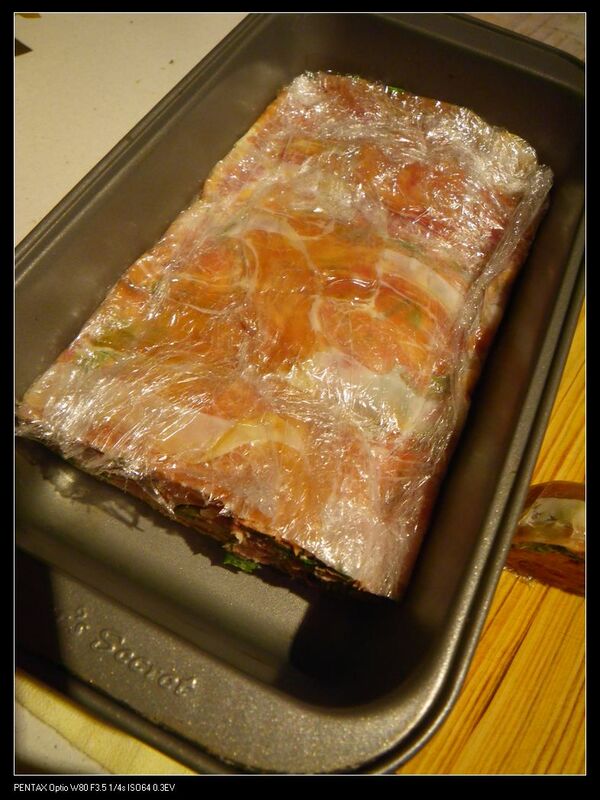 Now put that rectangular shaped foam onto the terrine mold and place something that is really heavy on top of it. I used my timber cutting board with several glass bottles, just to make sure the terrine is as tight as possible. Put the whole lot in your fridge and cool for at least 3-4 hrs. After 3-4 hrs, the volume of the terrine has dramatically reduced. 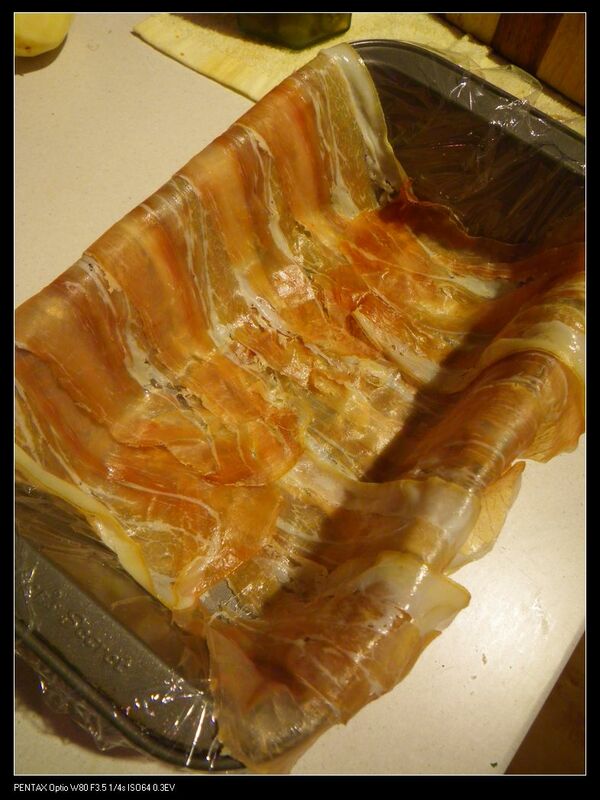 Now, you can cut the terrine into smaller pieces, making sure to remove the cling wrap though :P, and serve on crisp bread with a piece of gherkin, if you like some sweetness. Otherwise, drizzle a little little bit of extra virgin olive oil or truffle oil and serve. Emm, yum and beautiful!! They make really good appetisers and starters in a party! Enjoy!! Can I simply say what a reduction to search out someone who really knows what theyre talking about on the internet. 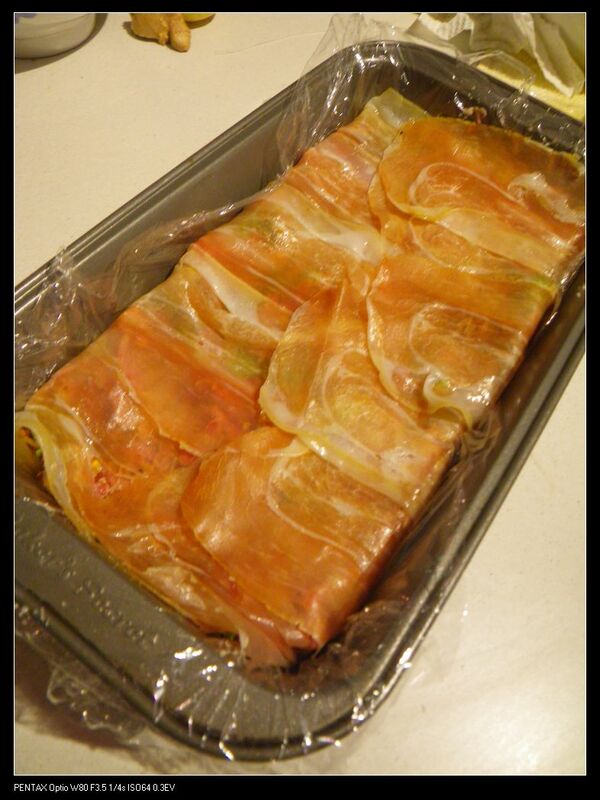 You undoubtedly know easy methods to make the terrine. Other bloggers need to learn how to make their recipes simpler by putting stepwise photos on their site! Great job! I found your weblog site on google with some of your early posts. Continue to maintain up the very good operate. I added your RSS feed to my Google Reader. Looking forward to reading more great articles! Looks very yum. They are good appetisers, ain’t they? Normally would cost $15 in restaurants as an entree.Great work! I’ll try this weekend and let you kno! Oh, yes. When you try it out, you may want to omit the roast duck cos I found it better glued without the duck. The texture was smoother.